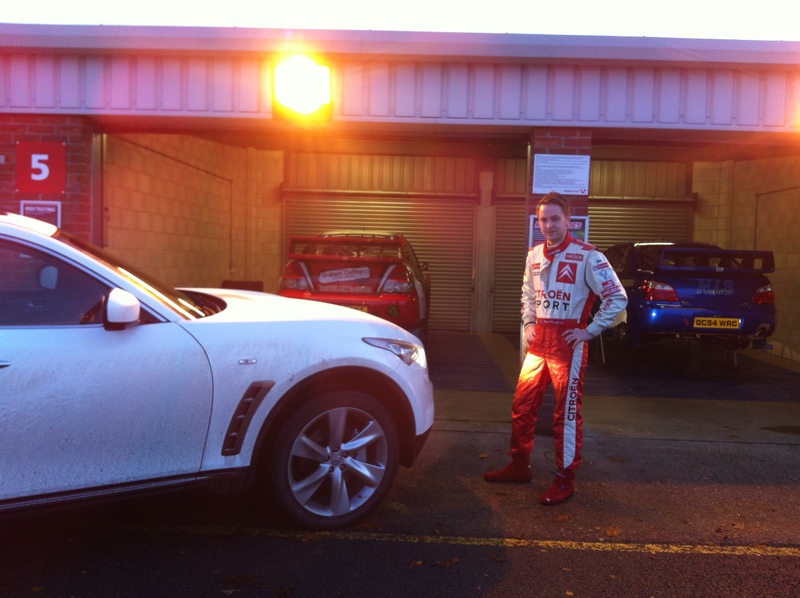 Paul took a V6 diesel Infiniti FX for the weekend, and came back a rally winner. But that’s not all he won on at Oulton Park – here’s what happens when you take a sports SUV to the racetrack. The launch of the brand new Infiniti Centre Hull last Thursday in my role as presenter at 99.8 KCFM started off a weekend that ended up being a bit of a whirlwind for me. Firstly to be involved with such a big story for motoring in Hull was brilliant, and I’m sure I speak for all those who attended the VIP launch bash in saying the team at Humberside Motor Group did themselves, and the brand proud – what a night. 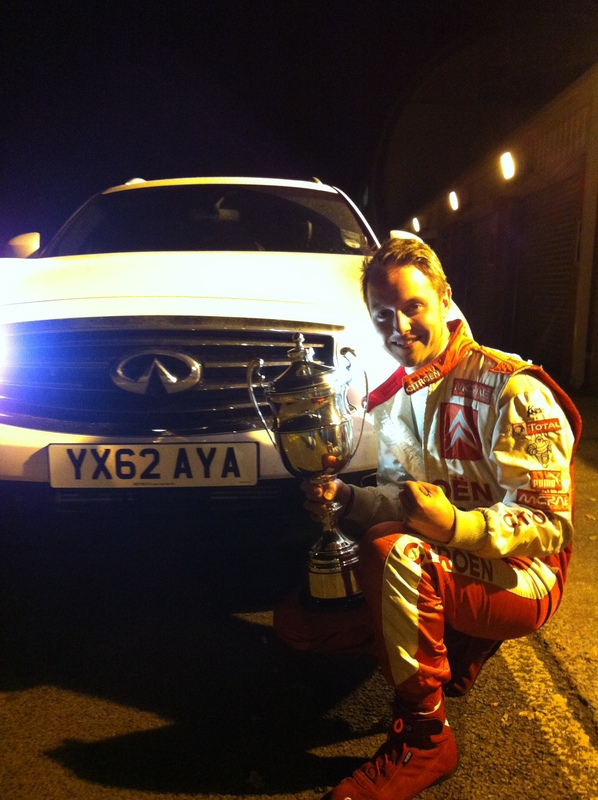 Fresh from a Formula One-inspired launch party, I was then en-route to Oulton Park in Cheshire to compete in a World Rally Car in the Neil Howard Memorial Stages Rally alongside top European rally driver Graham Coffey. Which seemed like the perfect chance to show off an Infiniti to a circus of petrol heads whose daily modes of transport – between Helicopters – originate largely from Germany. Plus, Sales Manager Ben had offered me the chance to test one of the cars out for myself to fully understand what ‘inspired performance’ was all about, and it would have been rude not to, right? The FX 30d S ‘Premium’ was my appointed transport for the trip to Cheshire, and although I was looking forward to the novelty of a weekend driving a different car, what I wasn’t prepared for was the actual Infiniti experience, and how much I would come to love the car as a driving machine. I consider myself a deep-rooted part of the afore-mentioned ‘petrol head’ fraternity, and have driven a range of performance cars over the last few years, as well as competing in everything from a Group B Metro 6R4 to a Ford Focus World Rally Car. I also present a Motorsport TV series on Sky and have written for a number of motoring magazines. So my motoring ‘experience’ gave way to the thought that I had the concept of the ‘SUV’ pretty much nailed down. I was wrong. ‘SUV’, for those of you who are unsure, stands for Sports Utility Vehicle. A phrase which is fairly ironic when you consider the driving characteristics and legacy of many of the cars which proudly squeeze themselves into this category. I’m setting the scene for this review, I know, by saying the Infiniti FX puts the ‘Sport’ into the acronym. Immediately, you climb into a ‘cockpit’ (interior just doesn’t do it justice) that feels like a sports car. The seats are supportive, with a pattern on the leather which briefly hints of supercar. The dashboard and dark headlining which adorns the raked roof add to the sporty feel, and are of a quality and design befitting a premium car, but it is the view immediately outside of the windscreen which steals the show. From the outside, the bulging front wings make for an unmistakable profile, and they give the car real character. They match nicely the marque’s marketing claims that the “perfect line is a curve”. But from the inside, sitting there looking at the sweeping bonnet which intrudes proudly on your line of sight, the design just makes complete sense. It might sound strange to say that being able to see the bonnet from the driver’s seat is enough to classify a car as sporty. But if you’ve ever driven a ‘60s sports car, or sat in a new-age supercar, you’ll know it’s a less of a characteristic, and more of a key ingredient. It’s no surprise to report keyless entry, auto-opening tailgate, more parking cameras than the Big Brother house and a whole host of gadgets you’d expect of a car with a ‘Premium’ title. But rather than being gimmicks, or there to make the FX look good on paper, they have all been well thought out, and work very well as an overall package. They have to of course – the car’s pitched against highly acclaimed rivals, and these are not ‘nice to have’ features when you’re competing on the front line against BMW, Mercedes and the like. From the minute you press the ‘start’ button and the dials flick round before settling down in anticipation, the car lives up to its sports car roots. On the move, the steering has plenty of feedback and is nicely weighted, not too light as you might expect. In sport mode, the suspension is firm enough to give the steering and balance of the car a very confidence-inspiring, precise feel. Not in-keeping with the car’s size, in the slightest. The diesel V6 may lack the refinement and economy of some of its rivals, on paper. But luckily this is something which the designers clearly came to terms with at an early stage in the car’s development. Choosing, instead to concentrate on giving the FX a handling and drivetrain package that is so well thought out that you’re too busy reminding yourself you’re not in a sports car to worry about the minor oily details. The technical bods at Infiniti even mounted the engine at a specific angle to maximise efficiency. With some revised engine options joining the Infiniti model range next year, and the promise of additional product development which invariably follows a brand’s launch in a new market, things can only get better for those looking for a bigger compromise between economy and performance. The soundtrack is pretty good too, whether your ‘thing’ is to listen to the engine note, or your favourite driving songs through the ‘BOSE’ speakers. Again the trait of a high-end sports vehicle, the cabin does a good job of keeping the less appealing sounds of traffic and road noise down, while giving enough of a feel for what’s going on under the bonnet. It’s the attention to detail though which really makes the car, for example the huge, purposeful performance 4-pot brakes and the wheels displaying the same ‘Enkei’ logo as the RedBull Formula One cars. In a market saturated by premium ‘this’, and exclusive ‘that’, the FX’s subtle, quality touches give it a quiet confidence – and I would strongly argue – the edge. Back to my weekend’s activities, and the car became a part of the furniture in the pit lane at the Oulton Park race circuit, getting admiring glances and the customary hand-cupped peers through the windows from intrigued rally drivers and team members. The Infiniti is still a rare enough sight on UK roads that it gets double takes and sparks random conversations at the pumps; something I’ve previously only known while out on the road in a competition or classic car. The car’s practicality, to a certain extent is a pre-requisite. It capably handled luggage for myself, my girlfriend and a youngster. The versatility of the FX means it won’t – or shouldn’t – be over looked by people looking for a good all-round premium family car that can double up as a unique, and attention-grabbing daily driver. And in the same way that Infiniti has partnered with double Formula One World Champions Redbull, the FX played its part in a double victory this weekend. After a hard fought day of full-throttle action in the ex. Petter Solberg World Rally Car, I achieved my first ever rally win. Amidst the celebrations in the team pit garage, I also fulfilled another ambition in proposing to my girlfriend, to take the double and top off a very special weekend that started, and ended with Infiniti. 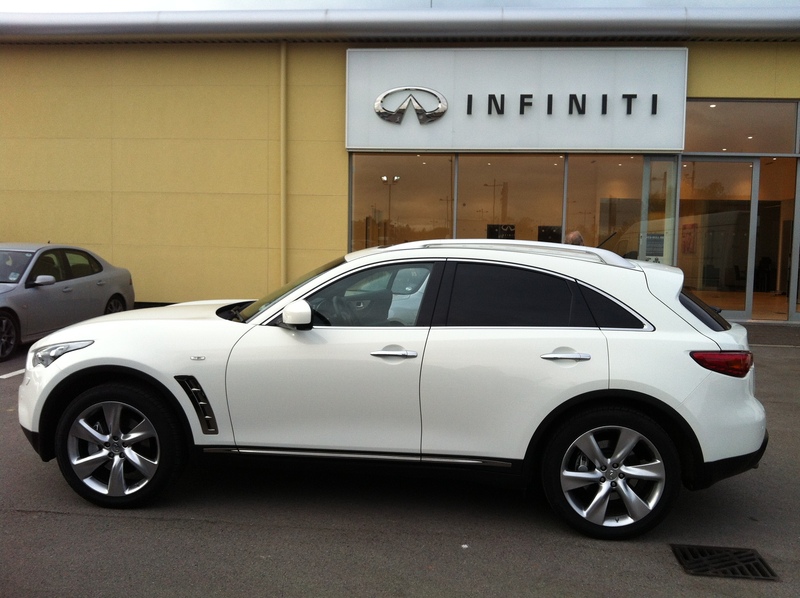 So, it was with a heavy heart that I drove the FX back to the Infiniti Centre Hull. Because not only had the car exceeded my expectations, changed my preconceptions, and given myself, my fiancé (!) and our five-year-old a fun-filled motoring experience. It had also, in a strange sort of a way, become a part of our new family.